What do you learn when your brain goes pop? Chris Licht had always been ambitious. When he was only nine years old, he tracked down an NBC correspondent while on vacation to solicit advice for a career in television. At eleven, he began filming himself as he delivered the news. And by the time he was thirty-five, he landed his dream job: a fast-paced, demanding spot at the helm of MSNBC’s Morning Joe—one of the most popular shows on cable TV. He had become a real-life Jerry Maguire: hard-charging, obsessively competitive, and willing to sacrifice anything to get it done. He felt invincible. Then one day Chris heard a pop in his head, followed by a whoosh of blood and crippling pain. Doctors at the ER said he had suffered a near-deadly brain hemorrhage. Chris’s life had almost been cut short, and he had eight long days in a hospital bed to think about it. 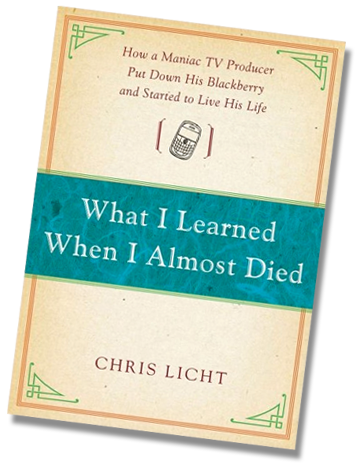 What I Learned When I Almost Died tells the story of what happened next. Click here to read Prologue and Chapter 1. Available now from Simon & Schuster. Order now at Amazon.com or Barnes and Noble.